What can your local association test? There are a lot of possible indoor pollutants in school buildings, including asbestos, lead, formaldehyde, fiberglass, radon, mold, bacteria, combustion products from vehicle exhaust (carbon monoxide, particulates and hydrocarbons), dust and chemicals from renovations, and products used for cleaning, art, science labs, and pest control. Temperature and humidity also affect indoor air quality (IAQ). 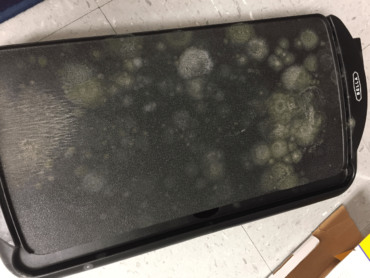 Improving IAQ in your school begins with careful documentation of problems with pollutants, ventiliation, temperature or humidity, as well as symptoms experienced by staff and students. The work can be undertaken by the local association, most efficiently by a local health and safety committee. Your UniServ field representative can help you organize a committee. NJEA has excellent materials for members to educate themselves and each other on IAQ, as well as forms for walk-through inspections. The committee can document IAQ problems and monitor changes, using walk-through inspections, member surveys, and measurements done by members. This article will address what members can measure themselves. 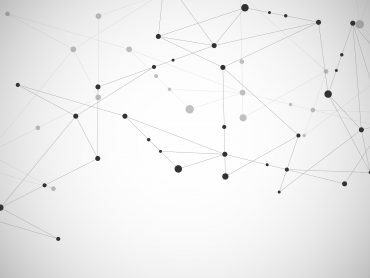 Devices that measure both temperature and humidity are readily available and can be used to document levels in different rooms over time. Carbon dioxide (CO2) Just the presence of people in a room will add various contaminants to the air (such as fragrances, other personal products, or perspiration). If the ventilation system does not supply enough outside air to dilute these contaminants, they will build up in the air. Carbon dioxide is the gas we exhale. It is not toxic, but because it is easy to measure, it is used as an indicator of the adequacy of outside air. Outside levels are usually 300 to 500 ppm (highest in urban areas). Many people find a room stuffy and experience symptoms such as fatigue, eye and throat irritation or headaches at levels of 600 parts per million (ppm) or more. National standards associations and the New Jersey Public Employee Occupational Safety and Health (PEOSH) program consider levels above 1,000 ppm unacceptable. 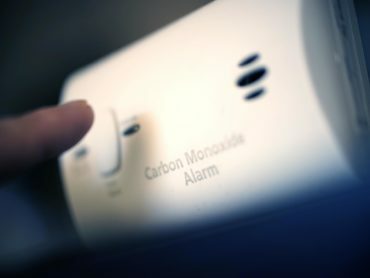 Carbon monoxide (CO) Combustion products from vehicles parked outside the school, in school garages, or in shop classes can enter the school through windows or outside ventilation intakes, and be distributed around the school by the ventilation system. Normal outdoor levels average only 0.12 ppm, and may reach 7 ppm inside homes with gas stoves. Moderate levels of CO (above 35 ppm) can cause headaches, sore eyes, and a runny nose. High levels (above 200 ppm) can be lethal. You can measure carbon dioxide with a portable direct-reading meter for $400 and up. Or you can purchase a small pump (also about $400) that uses single-use sampling tubes for carbon dioxide and other tubes for carbon monoxide. Alternatively, for carbon monoxide, you can buy a hardware store smoke/carbon monoxide detector for about $30. You can do limited sampling yourself, but usually it isn’t needed. When you see or smell mold, often the impulse is to ask for sampling—either air samples to measure concentration of particles in the air, or bulk or wipe samples, to determine what species are present. However, sampling is expensive, must be done by a specialist, and may not yield any more useful information than a good visual assessment combined with detection of moisture, and possibly assessment of contamination in the ventilation system. Interpretation of an airborne concentration of mold particles is difficult even for an expert because there are no standards. Scientists haven’t developed standards because there is such wide variation in individual susceptibility to mold, and so many kinds of mold. But you can assess the extent of contamination—first, with your eyes. Mold may be obvious or hidden behind paint or wallpaper, under carpet, above the ceiling, or anywhere else where there is wet organic material. Where there is moisture, mold will follow so look for bowed ceiling tiles, accumulating or standing water and damp building materials such as wallboard and carpeting. Instruments can help. These are direct-reading instruments that can measure moisture levels in a variety of building materials following a fl ood or other water damage. Moisture meters are small, handheld devices that have a thin probe or needles that can be inserted into carpet, wallboard, wood, brick, concrete, and other materials without damaging them. They can also be used to monitor the progress of drying materials. (If water-damaged materials are dried within 48 hours of becoming wet, they are unlikely to become moldy.) Moisture meters range in price from $40 to over $500, and can be rented. Another device that may be helpful is a boroscope. This is a handheld tool that allows users to see potential mold problems inside walls, ceiling plenums, crawl spaces, and other tight areas. It consists of a small video camera on the end of a fl exible “snake.” No major drilling or cutting of dry wall is required. A device called a biopump can give a total count of particles, including mold spores, pollen, skin cell fragments, and inorganic particles. Comparing levels in different areas may give a rough indication of hidden mold. It costs upwards of $700 but can be rented for about $35 per day. This sort of sampling is no substitute for a good visual mold and moisture assessment. An infrared camera shows heat differences behind walls as shadows. You can detect a cracked pipe or sudden changes from warm to cold areas, indicating possible ventilation problems. Such cameras cost above $8,000, but can also be rented. Tool for mold assessment The National Institute of Occupational Safety and Health (NIOSH) has drafted a useful sheet designed for recording mold and dampness in each room. It is currently being piloted in various states. The current version can be requested from Michelle R. Martin of the Centers for Disease Control and Prevention at mij2@cdc.gov. Sandy: Is it safe to come back? Can you open doors and windows?